XS Records [pt netlabel]: [xs-59] essl.burger - live! As a netlabel, we've always been worried about bringing music with an ascending quality to people, although some our releases seem a bit controversial, since we try to get as much diversity as possible. 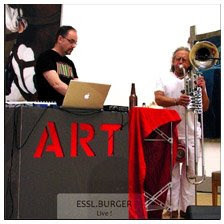 This month, we can say that we are extremely proud to release Karlheinz Essl's and Klaus Burger's duo ESSL.BURGER. Not only because Karlheinz Essl is one of the most relevant figures of nowadays improvised music with live electronics in Europe, but also because we believe that together with our previous release and the following we might be heading to new pathways and manners of discovering ourselves in the music we are in contact with (in our music as an ascetic path belief), and in what we believe to be our role in this universe.